Mayhem. Burzum. Black Metal. Black Circle. Church burnings. These are the keywords that define Jonas Åkerlund’s drama “Lords of Chaos”, a movie that focuses on the beginnings of the Norwegian Black Metal scene in the early 90s’, and the wave of violence that shaped and defined this aesthetic movement. So, is this a cult movie or just a mockery of those influential years? It’s something in between, as it details those horrific and violent events while feeling a bit easy-going at times. 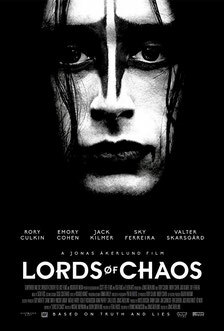 Basically, the movie revolves around one man’s vision for brutality and evil, and another man’s brutal and evil actions, and the dynamics between the two of them, though opinions seem to be divided, with the majority of people not liking “Lords of Chaos” so much. In all honesty, this could have been a far better movie than it actually is. I mean the title fits the subject matter and there is such a compelling story to tell, but unfortunately the movie turns reality into shock value, and as such some scenes fall a bit flat. But then again, that is black metal for you. Also, the voice overs, especially, ruin the magic of the movie by explaining too much of what should have been obvious (or at least they ruined it for me). This technique works wonderfully on Mr. Robot but it doesn’t work at all here, simply because the monologue in itself is badly written. Would Euronymous have liked to have his life depicted with voice overs? Probably not. Nonetheless it has some redeeming qualities in the main performances of Rory Culkin and Emory Cohen who embody two of the most recognizable figures of Black Metal – Euronymous and Varg respectively. As pointed out earlier it’s the relationship between them that is the driving force of the second and third part of the movie, but more on this later. The first part is dominated by the mysterious character known to the public as Dead, and his obsession with death and his desire to actually be dead (all those moments when he was goading Euronymous to shoot him make sense in retrospect) are quite riveting, thus making for a rather somber beginning. Dead’s suicide is the first serious event that the movie tackles and it does so in a very straightforward yet tragic way, his end being accompanied only by a voicemail from his father. Also it is the only part of the movie we see the band actually performing on stage. True enough, a bit later we see Mayhem in the recording studio, but the feeling is not the same as earlier. Furthermore, the other two murders shown in the movie (Faust killing someone who followed him out of a bar, as well as the murder of Euronymous) just fall flat and may even seem a bit comical. On a serious note the church burnings, and the subsequent police investigations and media coverage, are depicted with gravitas while Euronymous’ struggle to make his band and business successful add the necessary dose of emotion to the storyline. He is just a teen trying to make it in the ruthless music business at all costs, and as such, some of decisions may not have been the wisest possible, though they did shape the Norwegian black metal scene. On the other hand, Emory Cohen’s character’s progression from shy fan to violent mastermind is both fascinating and harrowing to watch, and overall his performance stands out the strongest throughout the movie, as he brings intensity and drama to most of his scenes. During a church burning scene he just watches and smiles at his work, very pleased with himself, making that particular scene extra dramatic and intense. Overall, I don’t think this movie does justice to the bloody history of 1990s’ Norway, even though it is based on ‘truth, lies, and what actually happened’. Is it worth seeing, though? I would say ‘yes’ because it is a page of metal history, even if some scenes may seem superficial and some plotlines may be depthless. Though made about infamous metal legends, the movie may appeal to many others (non-metal fans) as well. 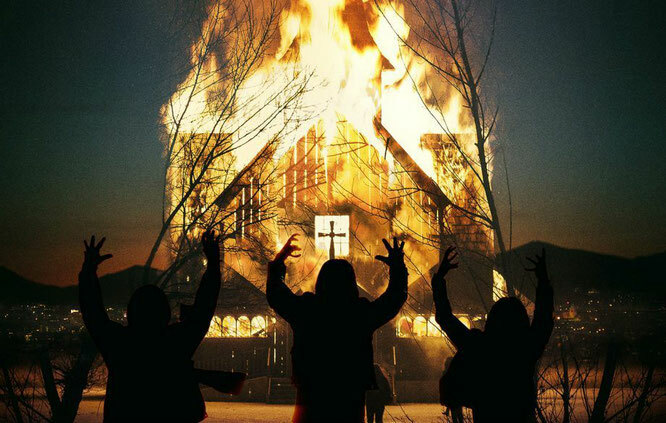 For a more in-depth and detailed take on these events, I suggest the 2008 documentary “Until the light takes us”, if not “Lords of Chaos” will give the watcher some insight into what and why it happened the way it did, trivial and cheesy as this insight may be.